Fricker's profile was first formed courtesy of his decade-plus of successes starting in the late 1940s. A British composer, he was celebrated by the musical establishment until the early 1960s. This admirable first recorded cycle of his string quartets presents a composer seemingly fixed on sobriety and intricate clarity. This music holds any hint of romance or sentimentality at arm's length and with bramble barbs outwards. Even the compact single-movement First Quartet, written in Fricker's late twenties, is a work that shuns outward allure. Instead it embraces an intensity that is either subdued or ruthlessly active. There are seven clearly discernible episodes. It was written at about the same time as his First Symphony (LP: Robert Whitney/Louisville Orchestra - Louisville S-675 (1967)) which met international success. It won the 1949 Koussevitzky Prize. The Second Symphony followed hot on its predecessor's heels. It too was recorded and issued in 1955: Sir John Pritchard/Royal Liverpool Philharmonic Orchestra, EMI British Composers 5757892). The Fifth Symphony has been issued by Lyrita (review). The Second Quartet was recorded by the Amadeus Quartet (DG, then Argo) who had commissioned the work - a signal honour. It too has a sombre aspect although there is some brilliant remission in the pizzicato central Molto allegro. That same movement at times looks forward to the blessedly hypnotic 'mobius strip' melody that lies at the centre of Fricker's A Vision of Judgement. Its echoes can also be heard in the Scherzo of the 1943 Adagio and Scherzo, the earliest work here and easily the most accessible. The last String Quartet is in five separately tracked movements. It dates from 1976, well after his move to California. This work was written in admiration of Elliott Carter; Fricker had been knocked sideways on hearing Carter's Third Quartet. The opening Presto is a bit "steady as she goes" in this performance but the following Allegro feroce is every bit as ferocious as you might expect. The fourth movement carries a modifier typical of the composer: Allegro inquieto — a mood of disquiet is in contention with the smile inferred by Allegro. The serious chin-set of the last movement takes us back several decades to his Op. 5 Wind Quintet. 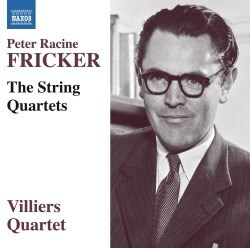 It was not so long ago that the Villiers recorded for Naxos the string quartets of another denizen of the post-World War II era - those of Robert Still. As with that disc this one is funded by the British Music Society Charitable Trust as part of the Michael Hurd Bequest. Good choice; likewise the BMS-sponsored recording of the symphonies of Francis Chagrin. Fricker has done reasonably well for recordings; though there are plenty of his works still to be recorded. In any event with little effort you can get to hear his First Violin Concerto - also a product of those high summer years for this composer - as played by Yfrah Neaman. Also courtesy of Lyrita there is the Cello Sonata written a couple of years before A Vision of Judgment. The two Violin Sonatas - one from each end of his career - can still be had via Amazon on Portrait and Cala. There are fascinating Fricker connections with other British composers. Fricker's Symphony No. 4 was written in 1966 and carries the extended title In memoriam Mátyás Seiber (1966). His unnumbered Sinfonia in memoriam Benjamin Britten dates from 1977. Fricker is the dedicatee of Humphrey Searle's Fourth Symphony. There is no sign of CPO - who have recorded all the Searle symphonies - embarking on a Fricker series. We must instead hope that Richard Itter recorded the first four Fricker symphonies. They would make an ideal addition to Lyrita's REAM label. Returning to the present CD, we have a richly populated note by Christopher Husted and a well appointed, atmospherically open recording. This Naxos disc forms a valuable companion to Delphian's disc of Seiber's three quartets including the Quartetto Lirico which was also recorded by the Amadeus. Fricker was one of Seiber's pupils.